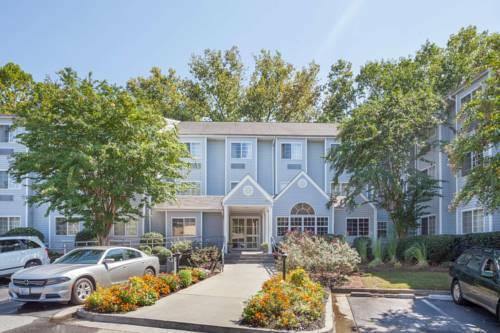 Relax at this consistently enjoyable Microtel Inn and Suites by Wyndham Atlanta/Buckhead Area conveniently located off Interstate 85 near Atlanta Braves games at Turner Field, downtown Atlanta, the Fernbank Museum of Natural History, shopping and lively Buckhead nightlife. Enjoy Creole meals and live entertainment at Zuffys Place nearby. Ideal for business and leisure, this hotel offers complimentary continental breakfast, complimentary wireless Internet access, and complimentary parking for vehicles of all sizes. Meeting space is available for business and social functions, as well as 24-hour copy and fax services. Guest room amenities include desk, refrigerator and microwave. Suites, smoke-free and handicapped-accessible rooms are also available. Pets are welcome at this lodging. There is no charge for children 17 and under with an adult.